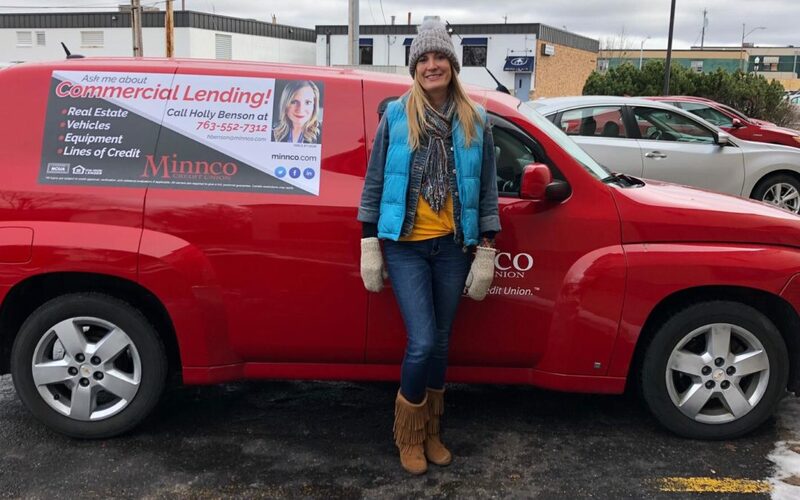 Holly Benson and I talk about the wonders of archaeology, her love for the Minnesota Vikings, and the personal side of being a commercial loan officer. Holly Benson and I met up at the counter of a Caribou not too far off from the Minnco Credit Union where she calls home. As soon as I walked up to the counter Holly introduced herself with a wide smile and gentle voice, and I knew we would connect. Her blonde hair was pushed back by the aviators that sat atop her head and they seemed to perfectly complement her leather jacket stitched with roses. Her purse was Vikings themed. After exchanging pleasantries, we picked a table and sat down. Anthropology is the study of human behavior as it applies to groups and culture, and I could instantly see how her studies played into being a commercial loan officer. The archaeology side of her degree is what forms her hobbies. “I still get my National Geographic magazines,” she said with a wide smile. “If I’m scrolling through headlines and I see one that says ‘old bones discovered’ or ‘Viking ship found’ I’ll click. I may not be completely up to date on politics, but I know what bones have been found!” she laughed. Still, I found Holly making it to the final round impressive since it’s not an experience many people have. “I had Glamour Shots done for it and as you know, back in the day Glamour Shots were big time,” she said raising her eyebrows. “I still have my costume. It gives me a lot of nostalgia! Dusty and musty, see! What is it with me?” she laughed. Holly also witnessed the infamous missed kick in 1998. “They [the Vikings] just take your heart and stomp on it sometimes. But I’m right there next year,” she said. Holly’s words struck a chord with me, and as we packed up and said our goodbyes, I thought about how important it is to have people who root for us. It’s because of people like Holly that our communities and businesses are strong, and like so many others, I found myself thankful to have met her. Great story. We need more people in this world like Holly. Go Vikes!